Parents often wonder how we test a child’s hearing when they are only a few years old. Dr. Andrea Federman demonstrates how the Hearing Center BayCare Clinic tests a child’s hearing in this video. Having a tooth removed is probably the last thing most people want to have done. However, there are options patients have that will make them as comfortable as possible. Did you know about 10% of people have ample room in their mouth for wisdom teeth? But what determines if a patient should have their wisdom teeth removed? Sciatic pain is a common condition that affects people of all ages. Although the pain typically only affects one side of the body, the pain can radiate through the back, thigh, and leg, leaving patients in debilitating pain. Hearing loss does not solely affect hearing –it also has an impact on a person’s entire life. I have compiled five facts one should know about adult hearing loss. How do I pick a plastic surgeon? Plastic surgeon Steven C. Schmidt, MD, has a few tips to help you be a more knowledgeable consumer. Amblyopia or lazy eye, is a condition where an eye does not see to its full potential. This usually happens very early in life. A cleft palate is a congenital malformation – meaning it happens early in the pregnancy. It’s not only cosmetic; it is also a functional issue. Watch plastic surgeon Dr. James Zasuly discuss the abdominoplasty, a surgical procedure to remove excess skin from the abdomen. There are new ideas in cures for sensorineural hearing loss that may have some validity. Chickens have a way to restore their hearing; other cells can replace hair cells that have been damaged by loud noise. Could this help humans? Are you worried your children’s music is too loud? Have you attempted to set limits on their iPods? Audiologist Dr. Andrea Federman discusses noise-induced hearing loss in her latest video blog. it really that important to wash your hands before contacts? Yes! BayCare’s Green Bay Eye Clinic’s Todd Sieloff, ABOC, COA, NCLEC, tells us why. BayCare’s Green Bay Eye Clinic is excited to announce M. Camille Almond, MD, is now offering refractive surgery to their patients. Get to know Dr. Almond here. Oral and maxillofacial surgeon Michael J. Schuh, DDS, discusses why he and his colleagues use a 3-D x-ray to treat patients. Often time patients and their parents don’t know when the “best” time is to get them removed. We inform them, that in general, earlier removal of wisdom teeth results in less complicated healing times. A cochlear implant is a device that may be more appropriate than a hearing aid for a patient who has a severe or profound hearing loss and who does not gain significant benefit from hearing aids. Have you heard about the new treatment options for macular degeneration? BayCare’s Green Bay Eye Clinic’s Dr. Wang informs us in this video blog. We continuously strive to better serve our patients. The Hearing Center BayCare Clinic has added a location on West side of Green Bay. New patients are welcome! 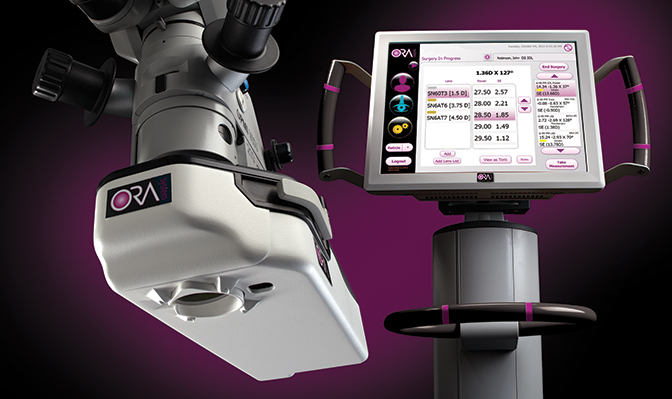 Cataract surgeons at BayCare's Green Bay Eye Clinic are proud to be the first in this region to utilize another new revolutionary technology for cataract patients, the ORA system.